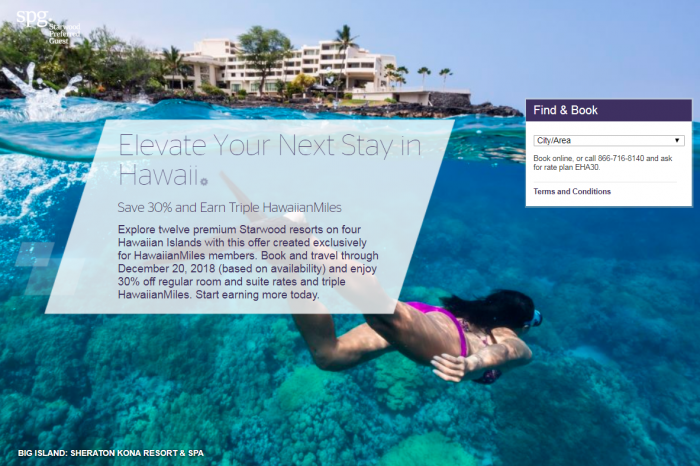 SPG has launched new 30% off sale for stays in Hawaii through December 20, 2018, that comes with triple Hawaiian miles. You need to have airline deposit enable per the T&Cs to get the discount but in reality this is not required unless you really prefer earning Hawaiian miles instead of Starpoints. Note that the 30% off discount is from the Rack Rate. This means that when there are discounted rates available those are likely cheaper than this. Hotels in Hawaii often has discounted rates for locals. You need to have a local ID to have access to those such as drivers license. This one is tied to Hawaiian Airlines but don’t actually require you to deposit miles there. Offer valid for Airline Direct DepositSM participants for eligible stays at participating resorts in Hawaii through December 20, 2018. Offer is subject to availability, black-out dates and changes. Advance reservations required. To receive the bonus miles, guest must be a member of Starwood Preferred Guest, and have selected Hawaiian Miles as their currency of choice in advance at www.spg.com/moremiles. With Airline Direct Deposit, the Starpoints earned from only hotel stays and select bonus offers will be converted automatically to the member’s airline account and may not be transferred back to Starwood Preferred Guest. To book this offer by phone, call 1-866-716-8140 and request rate plan EHA30.. If you have a confirmed reservation on another rate plan and wish to change it to rate plan EHA30, your request will be subject to availability. Bonus miles will credit to the airline account within 4-6 weeks after the qualifying stay posts. No additional bonuses earned from the stay, including but not limited to the Starwood Preferred Guest 50% elite bonus, will be doubled/tripled. Miles accrued and awards issued are subject to the rules of the Hawaiian Miles program. Taxes and fees related to award travel are the responsibility of the passenger. Valid for 30% discount off the full-published retail standard guest room (non-discounted Rack) rate and excludes taxes and resort charges. Rates shown are: subject to change; per room, per night, based on single/double occupancy and availability at time of reservation and do not include additional per room, per night charges that may be imposed or state/local taxes. Additional room and suite categories/rates may be available. Regular season rates are listed; higher seasonal rates apply. An eligible stay is defined as one or more consecutive night paying a qualifying rate in the same hotel regardless of the number of check-in or check-outs that occur and post to the member’s Starwood Preferred Guest account.